Hello blog friends! Today I’m excited to announce an exciting new project with Tom Holtz and Lindsay Zanno that we want YOU to be part of! We’re editing a new edition of the excellent pop sci book The Complete Dinosaur, published by Indiana University Press. Like the previous two editions, this book will feature the latest and greatest in dinosaur palaeontology in a format that should be accessible to nonspecialists. This time around, we’re seeking input from future readers on what you would really love to know about dinosaurs! We’re bringing a little bit of citizen science and crowdsourcing to this edition, and we hope you’ll join us in making this one of the most exciting dinosaur books out there. 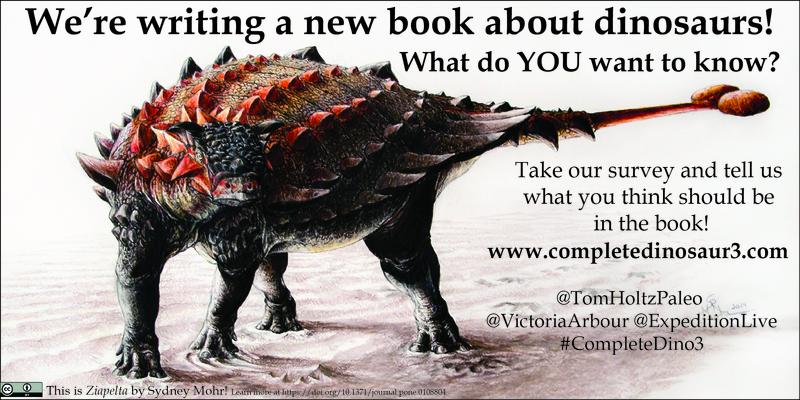 Head on over to the Complete Dinosaur, 3rd Edition website and take our short survey! We’ll be posting updates on the book’s progress as we go, so you can also follow the #completedino3 hashtag on Twitter and follow myself, Lindsay Zanno, and Tom Holtz for more. If you’d like to help us spread the news on Facebook, Instagram, Twitter, in classes or presentations, feel free to download and share our social media images at this Google Drive link.